Peru's president Alan Garcia today committed to expanding their national program, the largest in the world, including developing national facilities for manufacturing / assembling laptops in-country. They will distribute their 1 millionth XO by the end of the year, reaching students in 100% of the country's public primary schools, and 15 percent of all registered public school students. Some of these schools will get XO-1.75s, and 20,000 schools will get additional LEGO WeDo kits for use in class robotics programs. Rodrigo Arboleda said of the latest announcement: "Being the largest deployment worldwide, Peru is an outstanding example of OLPC. We hope to see other countries establish manufacturing facilities of the scale and magnitude of Peru's. Local manufacturing of XO laptops will enable Peru both to transform education and to make important investments in its economy." And the Peru Ministry of Education continues to invest in developing new Sugar applications and learning games for their own schools and others, finishing translations of Sugar into Aymara and Quechua, and translating a teacher's curriculum guide -- most recently into French for schools in Madagascar. Frankly speaking my first reaction, particularly when it comes to XOs being manufactured in Peru, is one of cautious skepticism. This is mainly due to two aspects: First of all general elections are being held in Peru this Sunday, April 10 and Alan Garcia is the outgoing president. So unless the necessary budget has been set aside already I'm not sure that his announcements really matters as the next government (which will be sworn in at the end of July) might simply go into another direction. Secondly I'm having somewhat of a hard time believing that we'll really be seeing Peru "start production of the XO laptop 1.75 by the end of the year" (a quote from the press release). Setting up the necessary infrastructure and know-how alone takes a significant amount of time and unless these efforts have been going on for a while already that 8 month timeframe looks unrealistic to me. The part about reaching 1 million XOs by the end of the year is also very ambitious but at least doable considering that the announcement above was made during a ceremony celebrating the hand-out of XO number 500,000. I very well know that at this point some people in Boston, Miami, Lima, and elsewhere will call me a hater;-) So let me emphasize that this is a record of my initial gut feeling which might as well turn out to be wrong. If that's indeed the case than this is certainly one of the most important announcements ever when it comes to OLPC. Particularly the establishment of manufacturing and assembly facilities would be an enormous win for Peru as a country. So maybe I was wrong in predicting that Montevideo will be the OLPC capital of the world and it might just turn out to be Lima. P.S. There's at least one factual error in OLPC blog's announcement as the French translation of Sdenka Z. Salas Pilco's famous "The XO laptop in the classroom" manual was actually made by OLPC France volunteers and not the Peruvian Ministry of Education. the Ministry nor OLPC. In order to clarify, it was the Somos Azúcar international team) who is responsible for such initiatives." Update #2 (April 5): Please make sure to read the comment by OLPC Association's CFO Robert Hacker which directly addresses the two concerns I had raised above. To say that I'm excited about this development is quite an understatement! 2. An existing local manufacturer will produce the laptops, which greatly shortens the startup time for production; support from Quanta also shortens the timeline. 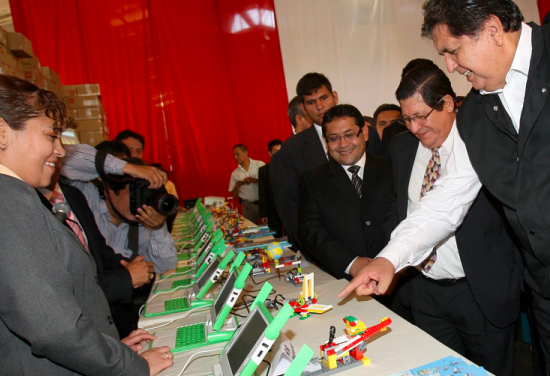 I agree that Peru is vying for "OLPC capital of the world" against the great success of Uruguay. Other noteworthy candidates for the title might also be Paraguay and Nicaragua. Smaller deployments but at the cutting edge in terms of realizing the full benefits of OLPC. Wow!! This is really great news! We've only been promoting local XO assembly for 4 years now. Glad to see OLPC/Quanta are seeing the light. Robert, thanks so much for the clarification. I've added a note to my original article pointing people to your comment. Regarding your concerns for Peruvian manufacturing, it should be noted that Peru is famous in the region for its 'maquila' competencies, which essentially means that they have a strong record for assembling pretty much anything that's thrown at them, from shoes to cars. Vahid, having lived in Peru I'm well aware of the country's manufacturing industry. However I had never heard of much high-tech / ICT manufacturing (e.g. of laptops) taking place there. The high tech industry doesnt exist in Peru, there are only a couple of companies which assemble PCs and Laptops but all internal components are imported. The government of president Garcia ends in July!. And the OLPC is a project of the Garcia´s government no a national program. The next government is not obligated to continue the OLPC program.